White canes and guide dogs are great for helping those who are blind or partiality sighted to navigate curbs and tripping hazards. But what about hanging branches, low doorways and overhangs? There’s never been a way for blind people to spot these obstacles. But now a pair of University of Toronto graduates has come up with a device that can clip onto a lapel or collar that will alert users to high objects that no cane or guide dog could see. It’s called “BuzzClip” and it’s a small device that vibrates when it detects nearby objects. The closer the user gets to the obstacle, the more intense the vibrations become. And users can set the device to spot objects as far away as a full metre. Inventor and civil engineering grad Bin Liu says the device takes existing technology and re-purposes it for the blind. “We use essentially the same technology as car reverse systems. It uses ultrasound to detect how far something is,” he explained to CTV’s Canada AM Wednesday. Rather than replace other visual aids, the BuzzClip is meant to supplement them. “Canes and guide dogs are very efficient for lower body objects, but not for upper body or for obstacles such as low-hanging branches,” he said. Liu came up with the device because his own father has already begun to experience visual impairment. “My dad has glaucoma. He has a lot of vision left but he’s over 50 years old so it’s only going to get worse. My intention was to create something he could use,” he said. Inspiration for the BuzzClip also came from Liu’s business partner, Arjun Mali, who has spent decades volunteering with his family at an orphanage in India for blind children. “So he was on board from the first second,” says Liu. Many of the kids at the orphanage have already been able to try out a prototype of the device, which has also undergone months of testing here in Canada as well. Liu says users are even finding new uses for the device he hadn’t even imagined. “So for example, they can gauge the distance of a lineup and see if the line is moving, instead of having to reach out and touch the person in front of them all the time,” Liu said. Or they can use it to help them find their garbage bin after garbage pickup, and other everyday tasks. Liu and Mali have now created a company called iMerciv to sell the device. Over the last months, the pair have raised more than US$61,000 through an Indiegogo online crowdfunding campaign. “That was to validate that our product was something that people actually wanted,” Liu explained. They have also received several hundred pre-orders and hope to begin delivery of the devices in April. 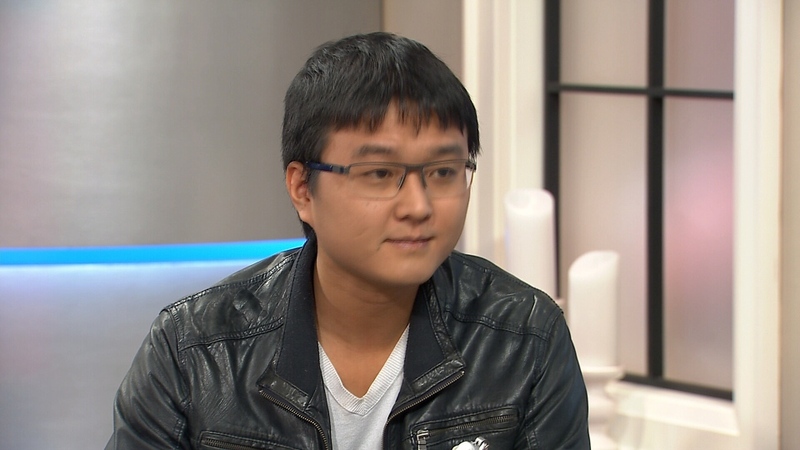 BuzzClip inventor Bin Liu speaks to Canada AM on Dec. 23, 2015.